While we might gasp every time that Burger King adds another patty to their Mega Mouth-Breaker Quadruple Whopper, nothing has really prepared us for this. In an attempt to break the Guinness World Record and probably cause some hungry burger-lover's heart to literally stop, Juicy's Outlaw Grill created a 777lb monster. 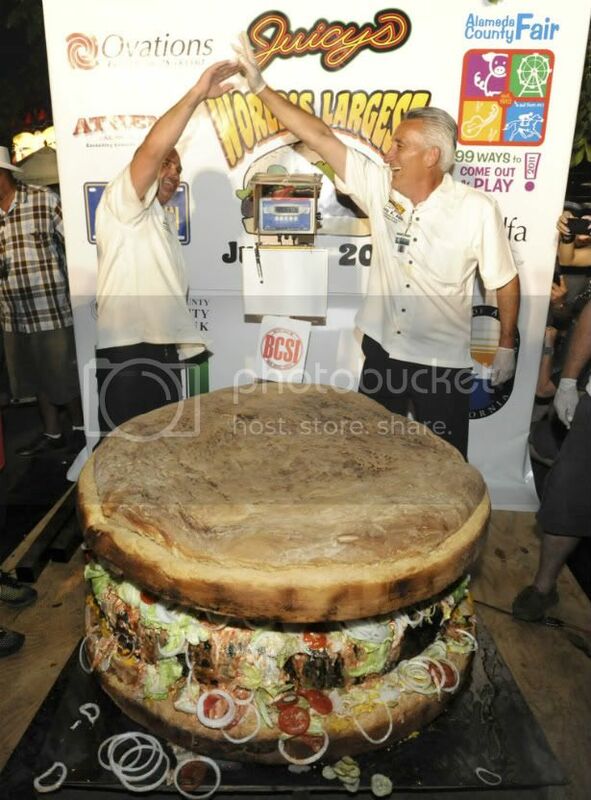 It was made on the world's biggest barbecue and contained 10lbs of mustard, 10lbs of mayonnaise, 12lbs of pickles, 20lbs of onions and 20lbs of lettuce. It took a massive 15 hours to cook which officially classifies it as 'slow food'. On-lookers could pay 99¢ for a taste but if you were interested in eating the thing then you'd be ingesting around 1.375 million calories. Not that you were interested. Right?